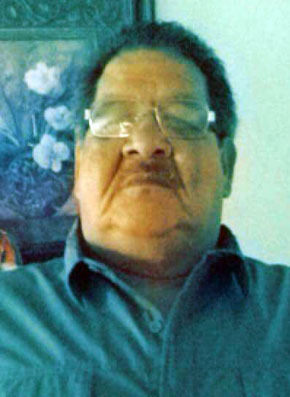 Services are scheduled for 10 a.m. Wednesday, Dec. 30, at Terpening & Son Chapel for Aristeo Ornelas Soto of Artesia. Soto, 55, passed away Wednesday, Dec. 23, 2015, at Artesia General Hospital. Alonso Jimenez will officiate at the services, with interment to follow at Woodbine Cemetery. Pallbearers will be family members. Visitation will begin at 10 a.m. Tuesday at Terpening & Son Mortuary. Aristeo was born Sept. 3, 1960, in Vado de Cedillos, Chihuahua, Mexico, the son of Toribio and Maria del (Pilar) Soto. He came to Artesia in 2003 from Mexico. He was married to Angelica Rodriguez in Cd. Juarez, Mexico. He was an owner and operator of the junkyard, a member of the Catholic church, and liked to sing and dance. Survivors include his wife, Angelica Rodriguez, of Artesia; parents Toribio and Maria Soto of Artesia; sons Fernando Rodriguez of Mexico and Augustine Rodriguez of Artesia; daughters Lisa Soto of Muleshoe, Texas, and Emily Rodriguez of Artesia; brothers Manuel Soto of Mexico, Toribio Soto of Oklahoma City, Okla., Pablo Soto of Moore, Okla., and Fernando Soto of Artesia; and sisters Graciela Soto and Lorena Soto, both of Artesia.